In my first two months on this column there has been one hot topic that I've tried my best to steer clear of, though I am increasingly finding this difficult. I'm talking, of course, about frame-rates and screen resolution; two issues that I guarantee would be groaned at if taught in schools. But in recent months these topics have imploded into a black hole of online discussion perpetuated by internet trolls and inflated, insincere arguments. This sudden craze in interest of game frame rates and resolution isn't because of a genuine interest in such factors. It's because the PS4 tends to – please brace yourselves – render games a tad better than the Xbox One. "This obsession with 1080p at 60fps as an assumed holy grail of next-gen gaming graphics is patently false"
In an industry where there has never been more homogeneity between the two main core consoles, the fact that one system is currently capable of something the other cannot quite manage is massive news. It was, of all games, the Xbox 360 staple Call of Duty that triggered the debate. In November, Infinity Ward studio head Jason Rubin confirmed that the Xbox One edition of COD Ghosts would render at 720p, while the PS4 version maintained a 1080p resolution. Then followed Tomb Raider Definitive Edition, which was shown to run at 30 frames per second on Xbox One and 60fps on PlayStation 4. As bumpy as those two announcements have been for Microsoft, perhaps worse was the revelation this week that Metal Gear Solid: Ground Zeroes would be capped at 720p on the Xbox One (and I'm sure you can guess what the PS4 resolution is). In fact, as you read this article, a new rumour is circulating that the upcoming Thief reboot will also be downscaled on the Xbox One. Though it has been extraordinarily tempting the past two months to write a column plainly entitled: "It doesn't frickin matter what the resolution is", instead I thought it best to avoid the subject entirely. Starve the trolls, etc. After all, you're a clued-up gamer who knows how to have fun, so why would you even associate such minor technical differentiations with the ability to enjoy yourself? The Order: 1886 introduces players to a unique vision of Victorian-Era London where people use advanced technology to battle a powerful and ancient foe. As a member of an elite order of knights, the player joins a centuries-old war that will determine the course of history forever. It just so happens that a new game, fully revealed for the first time today, has set the new benchmark for graphical standards. I've never seen a console game that looked so visually stunning as this. 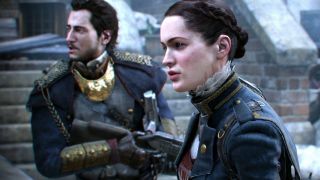 Developed at Californian studio Ready At Dawn, The Order is a sumptuous third-person shooter of unparalleled visual quality. The facial and body animation is outright staggering. Ready At Dawn tells me, in fact, that mastering each character's facial fidelity has been the biggest drain on the studio's budget. That's hardly a surprise, and yet it's amazing that so much time and money has gone into the outstanding audio work as well. This, for me, is the first next-generation game with that wow factor. It carries an unmistakable filmic quality, with production standards set so high that it borders on being indistinguishable from cinema. The most satisfying detail, then? It runs at 800p and 30 frames per second. Proof, if it were ever needed, that resolution and frame-rate are only components in overall visual splendour. With amazing use of colour, artistic lighting and film grain-effects, anyone with a plasma TV should be particularly excited about this game. It's due out in the autumn/fall 2014.